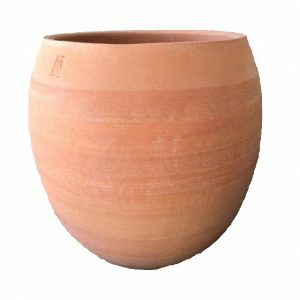 Buy frost-resistant, hand-thrown garden pots made from quality terracotta clay. 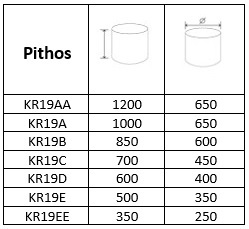 The porous nature of clay is perfect for healthy root growth. 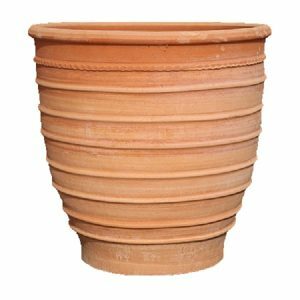 Our frost proof Terracotta plant pots are hand thrown by skilled craftsmen from the Island of Crete. 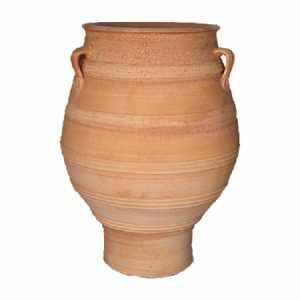 Choose from our range of authentic clay bowls, vases and large pots and pick from a range of sizes. We deliver all of our products in the UK with free delivery. 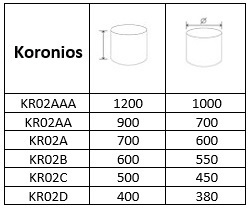 Due to their “hand thrown” nature, no two planters are the same and so your Cretan terracotta pot will be a unique piece of art in its own right. 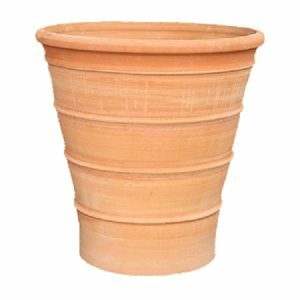 The terracotta plant pots in our contemporary collection offer a warm and classic look whilst providing a healthy environment for a wide range of plants, trees and flowers to flourish. 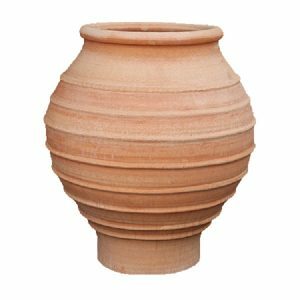 Clay is a tough and porous material that can create a cool and breathable environment for healthy root growth, so you can feel confident in adding a clay pot to your container garden. 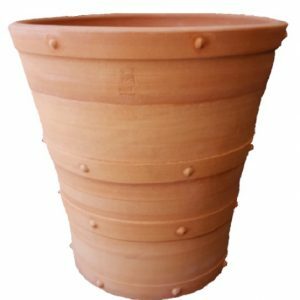 We coat our terracotta planters to make them waterproof, all of which is detailed in a descriptive label that comes with your order. 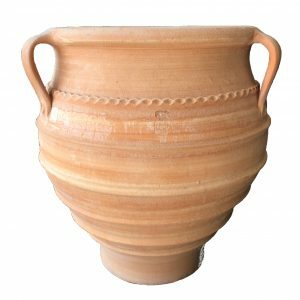 It will also detail the history and quality of the clay used to make your planter, as well as aftercare procedures so you can guarantee the longevity of your future antique. The arts of ceramics go back over 12,000 years and the clay used in this collection is specially selected to ensure the finest end product. 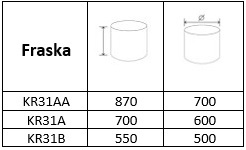 The quality material is worked and processed in huge mixing bowls and then stored at a cool temperature until needed. 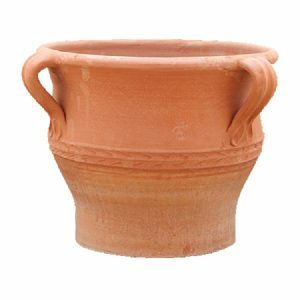 Each Terracotta planter is made slowly, with the large planters taking several days to be made. 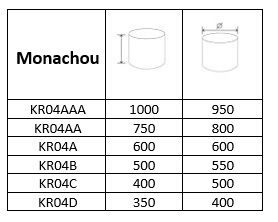 Each product is dried out before being fired for at least 14 hours in a kiln at very high temperatures to ensure the best quality. 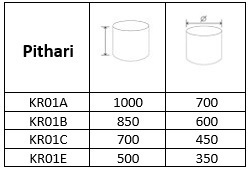 They are then slowly cooled for a further 14 hours, at which point all containers are filled with water for at least 24 hours. 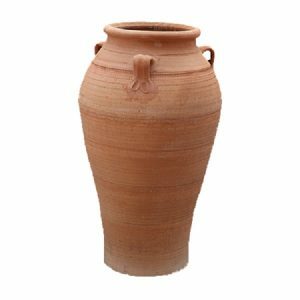 It is this process that gives the clay its hardy and cold-resistant qualities. 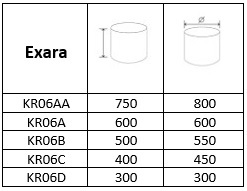 Take a look through our different designs and let us know which one you’re interested in for a free quote. 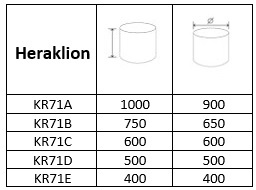 We can customise any of the above products if they don’t quite suit your requirements, so let us know what you need. Simply fill out our contact form and we’ll get back to you as soon as possible. 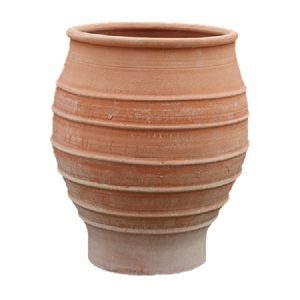 Or call us directly on 02476 559 416 and order your new Cretan terracotta plant pots today!